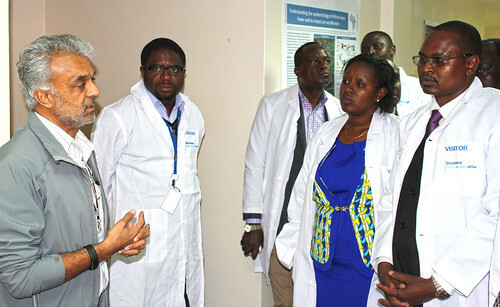 6 August 2015, Nairobi, Kenya --The BecA-ILRI hub hosted a lab tour for Kenyan parliamentarians drawn from various house committees. The Members of parliament were on a mission to assess the human and infrastructural capacity in agricultural biotechnology research in Kenya. 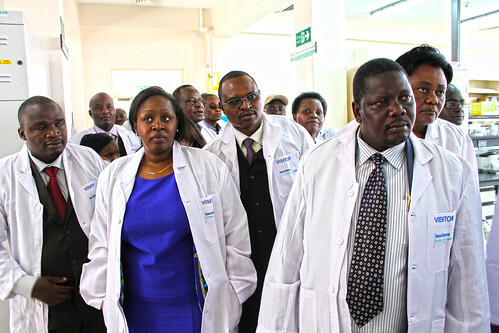 The tour which was organized by the National Commission for Science, Technology and Innovation (NACOSTI) under the BioAWARE programme in collaboration with the International Service for the Acquisition of Agri-biotech Applications (ISAAA), the Kenya University Biotechnology Consortium (KUBICO) and the African Agricultural Technology Foundation (AATF) included visits to Kenyatta University and the Kenya Agricultural and Livestock Research Organization (KALRO). The visit which gave the law makers an opportunity to interact with scientists was hailed as an eye opener by the chair of the education committee in parliament, Hon. Sabina Chege who took part in the tour. “I urge scientists to organize more such events to equip the legislature with vital information in research that will enable them make informed decisions” she said.